Over the course of a season a Winston Cup driver faces a grueling schedule. With 36 point races, The Winston, varied practice and testing sessions, it can be a demanding profession. Public relations, appointments, press conferences, and public appearances all take hours of the driver's time, but even with a break in the racing action this week, most of the drivers will take the time for charities and fans alike. NASCAR teams and the drivers spend more than 40 consecutive weeks on the road, with only three non-race weekends figuring into the equation, with the first break coming this past weekend. But even with the break, most drivers will continue their public appearances and charity work. Lets look at the some of the schedule for NASCAR's so called "bad boy" Tony Stewart. Being sponsored by the "Home Depot", Tony has made a commitment with them to do two public appearances a week at Home depot locations around the world. 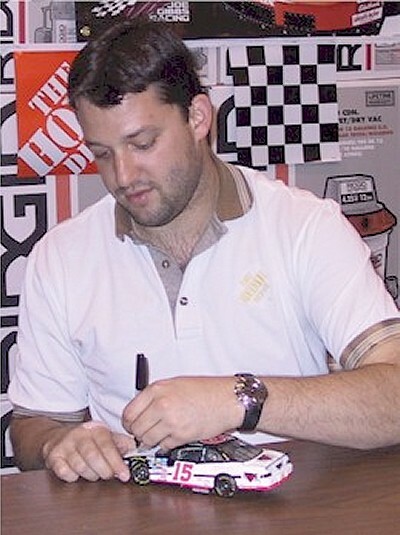 These autograph sessions last from 2-3 hours and Stewart will sign autographs for hundreds of people at each location. Last week Stewart made appearances in Maryland and New Jersey, and this week is scheduled at two locations in Massachusetts. Hopping from Jet to helicopter to automobile, Stewart has covered more miles in just the last two weeks than he raced in the entire year so far. This is a big commitment, and to the fans, it can make their day. Tony's schedule is so hectic that many wonder how he finds the time. But he does find the time, and to many fans that means a lot. Stewart also raced in the Eckerd 100 at the Dirt track @ Lowes Motor Speedway last Saturday. Getting a lift from Martinsville via helicopter, Stewart made the jaunt over after happy hour to run the race and then zip back for the race on Sunday. Last weekend he was scheduled to attend the World Of Outlaws race to watch Danny Lasoski pilot his ride to an anticipated victory. Having a tight schedule as it is, Stewart manages to also fit in time to host a "Fan Club Picnic" for all of the members in his fan club. This is usually held in Indiana, where he grew up. The fan club picnic is something he does every year to show thanks for all the fans support. It's a great time for the fans, as they can share the day with Stewart in a way few could imagine. This year, Tony plans to have 3 Fan Club Picnics, in different locations, so that everyone can have a chance to be part of it. Fan clubs picnics are being held in Charlotte, NC on May 20th, Indianapolis, IN on August 6th, and Phoenix, AZ on October 24th. 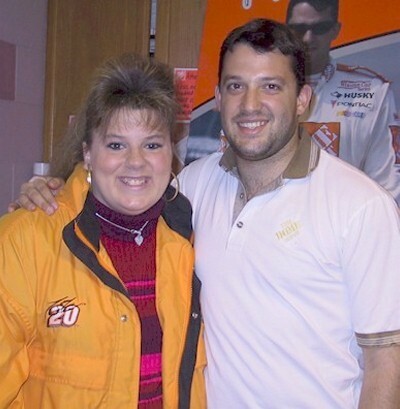 The "softer" side of Tony Stewart has always been well respected by his fans. This was never more evident than the recent fine that was issued to Stewart by NASCAR. In support of their driver, many fans sent money to Stewart to "help pay" for the fine. Stewart immediately seized the opportunity to donate the money to the Make A Wish Foundation, matching what the fans sent him dollar to dollar. While the little things in NASCAR sometimes go unnoticed, all of the drivers are working overtime on this week away from the action.